Ruth Patterson, a senior member of the largest unionist party in the North, Peter Robinson’s DUP, was arrested this [Friday] afternoon in relation to “sending a grossly offensive communication”. She was later released to cheers from supporters. A protest had been held by loyalists outside Musgrave PSNI station in Belfast city centre. Patterson, a well-known DUP hardliner and former Deputy Mayor of Belfast, created the controversy when she responded to a ‘fictionalised’ account of a gun and bomb attack on a forthcoming republican parade. The attack, in which senior Sinn Fein members and several members of the public would be killed, would provide “a great service to Northern Ireland” she said. Ruth Patterson is a former member of the British Army’s murderous Ulster Defence Regiment. She made the Facebook remark ahead of the planned republican rally in Castlederg, County Tyrone, on Sunday week. The event is being held to commemorate the deaths of two IRA Volunteers, Seamus Harvey, and Gerard McGlynn, who were killed in action forty years ago. Patterson’s comments were contained on a webpage which gave a detailed account of a loyalist massacre at the commemoration, in which dozens would be killed in an indiscriminate attack. Those killed would include Deputy First Minister Martin McGuinness, Sinn Fein president Gerry Adams and North Belfast representative Gerry Kelly. The author of the piece said loyalists could not be blamed if the events described were to take place. 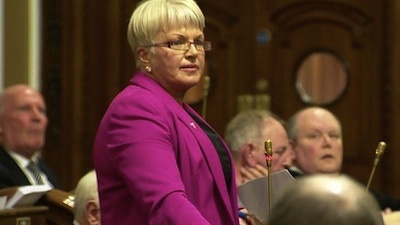 Patterson endorsed that comment, and described the senior Sinn Fein figures as “evil, devious scum”. Her comments have been widely condemned. Sinn Fein MLA Barry McElduff, who himself was also listed among the casualties of the future massacre, had called on the DUP needed to distance itself from Ms Patterson’s remarks. “This is a shocking comment from an elected representative who is endorsing the slaughter of people attending the parade by machine-guns, rocket-launchers and grenades,” he said. A DUP statement said Ms Patterson’s comments were not in keeping with the party’s policies or the standard of behaviour required of its members. “Whilst the officers of the party will clearly be looking at this issue they will take account of her subsequent statement,” it said. Patterson’s later withdrew what she described as a “flawed Facebook comment” and apologised. “I recognise that my careless comments fall short of the standards expected of anyone holding a responsible post,” she said.